When searching for a wedding veil, notice the different fabrics used and the myriad options available. Prices vary among the types of veil fabric employed, and so will the ultimate effect of each material. The most important considerations to keep in mind are: color, how the veil drapes, and the overall appearance. Illusion bridal is the most common fabric (not to mention most affordable) that you will find when you’re veil shopping. It comes in all sorts of colors, shimmers, and widths. Made of 100% nylon, this tulle should be a soft texture and have fine netting in a diamond shape pattern. Of course the quality will depend on the manufacturer. If you are looking to wear a veil with a blusher, illusion bridal works best. This is because it is the sheerest of all the tulle options, thus it photographs well. It has a medium body and can give you a higher pouf factor when gathered on a comb. If volume is what you are looking for in a veil, then seriously consider this material. We offer a curated selection of beautiful and quality bridal illusion tulle wedding veils of all different lengths or customize your very own bridal veil. Illusion bridal is the perfect cost-effective option for your wedding day and will look magnificent, but keep in my that it is a synthetic material not suitable for long-term storage and use. If you plan on prancing around the house in your veil 20 years from now, or handing it down to future generations, this is not the best veil fabric option; check out the next veil option instead! English tulle (also called English Netting) refers to any tulle that has a hexagonal weave and is made from 100% cotton. It is heavier and stiffer than other tulles, and considerable more expensive than bridal illusion, but less expensive than silk tulle. This type of premium fabric is not easily found, although some higher-end retailers will carry veils made from English tulle. Being a natural material, English tulle will stand the test of time. When gathered onto a comb, English tulle provides a slender and straight down drape with little volume or puffiness. English tulle gives a beautiful drape for drop veils, but it is not as transparent as bridal illusion. For these reasons English tulle is the best for single tiered veils. Silk tulle is the Cadillac of all tulle fabrics! Made from 100% silk, it is similar to English tulle in that it is produced in a hexagonal weave. A silk veil will be the hardest to find, so be aware of this when shopping online or in a retail store. Don’t assume that just because of the price you are getting real silk. Despite the price tag, many high-end salons primarily stock bridal illusion tulle. Silk tulle is soft, luxurious, and fluid – the fabric drapes and has little “body” of its own making it barely noticeable when worn. If you are seeking a wedding veil without the pouf factor, this is the way to go. It drapes and flows much better than other veil fabrics and sits flat even when gathered. Almost as sheer as bridal illusion, it can be suitable for a blusher layer as well. It is a natural fabric, which means it should last for generations to come. There are 2 types of silk tulle: French silk and Italian silk. Italian silk tulle is made from 100% silk but is a little coarser to the touch and has wider netting than the French silk. Italian silk tulle fabric is more suitable for adding trims. Quick tip: Don’t get confused by tulle and netting. The latter is used mainly in costumes and is a much heavier material. 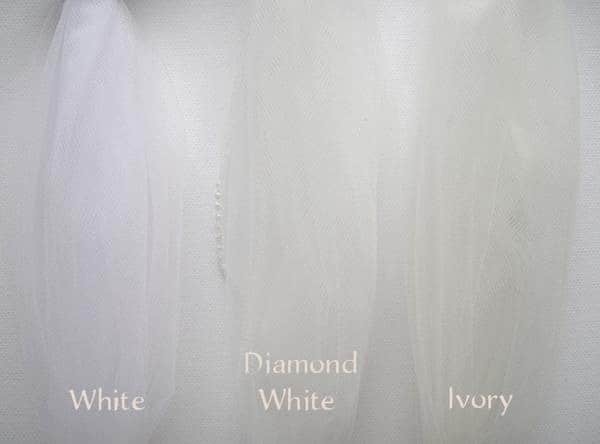 Here is a great photo series that illustrates the look and differences of each veil fabric type. Choosing the correct color for your wedding veil to match your dress can be a challenge. The following tips and photos can help you decide which veil/tulle color to pick. White Veil: White wedding veils are true white. If your gown is labeled white and it is not made from silk, your best bet is to go with a white tulle. You will never find silk tulle in this shade of bright white. Diamond White Veil: This is the most popular shade of white for veils. 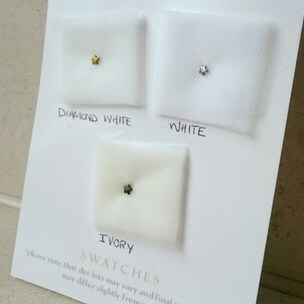 It is an off-white shade and is softer than white but not as yellow as ivory. Diamond white coordinates well with white silk, which isn’t naturally bright. It will also match a gown that is candlelight or antique white. Ivory Veil: Ivory wedding veils are a soft, light shade of ivory with subtle yellow undertones that complement ivory bridal gowns. They also work well with champagne & light gold color gowns. You may not be able to find the exact matching veil/tulle color for your wedding gown because all manufactures are different. However, you can definitely get close enough so that only a veil expert could tell the difference! If there is any noticeable color variation between your dress and your veil, choose a veil that is a shade lighter than your gown. 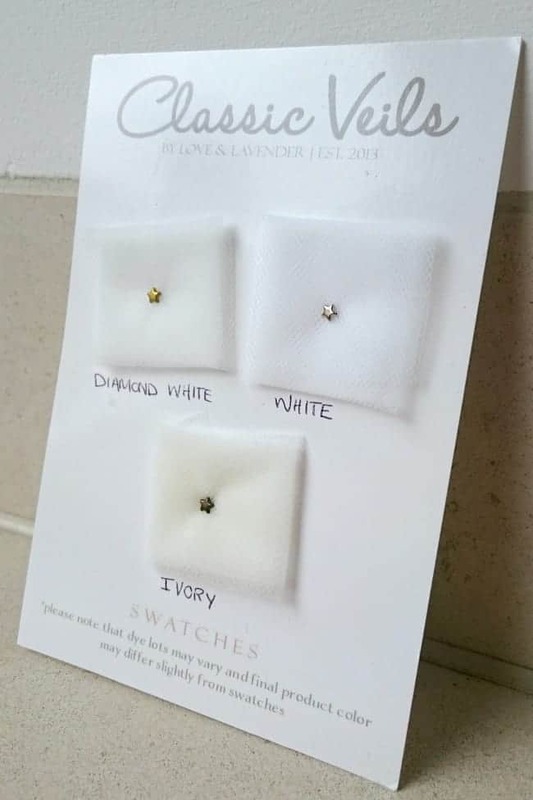 Still stumped by which color to choose from? If you are unsure of which veil tulle color to choose for your gown, it is a good idea (& one that we would highly suggest) to order a tulle swatch cards card. Its not always necessary, but it is a good way to confirm (in person) the right tulle color to match a gown.